hi I am igoalone. I play on KGS and DGS as Riani I am Currently ranked ? on KGS (haven't played in a while, but the graph shows 10-9k). Always have questions for listening ears. % Puzzles I am working on. KJD says that is punishment for when is in place. Continuation? Uberdude This only really applies when black has already exchanged a for b (which helps black fight if white pushes through the gap between and 2). 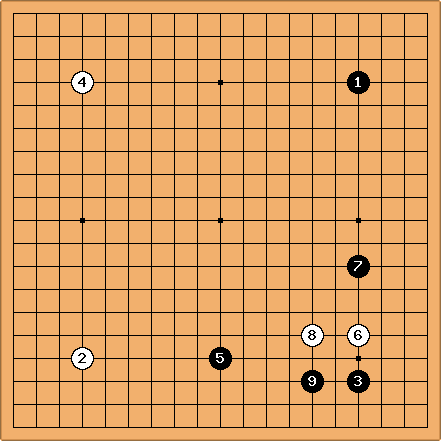 The point is without the B stone black would defend at c and then white would have sente to make the counter-pincer at 4. But with in place black can peep to fix the gap in sente and then play at 4 himself to secure his pincer stone and leave white with a weak group with no black weak groups to fight against. Wtih a ladder breaker around (a) no longer looks wrong and at is punished by the miai treatment . is the only way to possibly force a capture. but the continuation after is unclear. 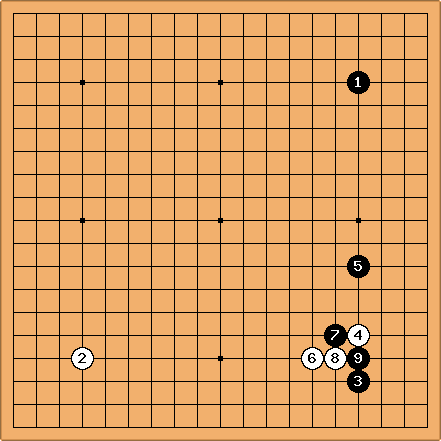 after at , joseki shows capture at b, not the logical connection at . I have a few Ideas and I'll post them later.